Come Home is the first book I’ve read by Lisa Scottoline, a New York Times bestseller. According to her website this is an author who ‘delivers taut thrillers with a powerful emotional wallop.’ This sounded like a perfect read for me in-between a few more typical ‘chick lit’ summer novels. So what’s it all about? ‘Jill Farrow is a typical suburban mom, who has finally gotten her and her daughter's life back on track after a divorce. She is about to remarry a great guy, her job as a pediatrician fulfills her, though it is stressful, and her daughter Megan is a happily over-scheduled thirteen-year-old, juggling homework and swim team. 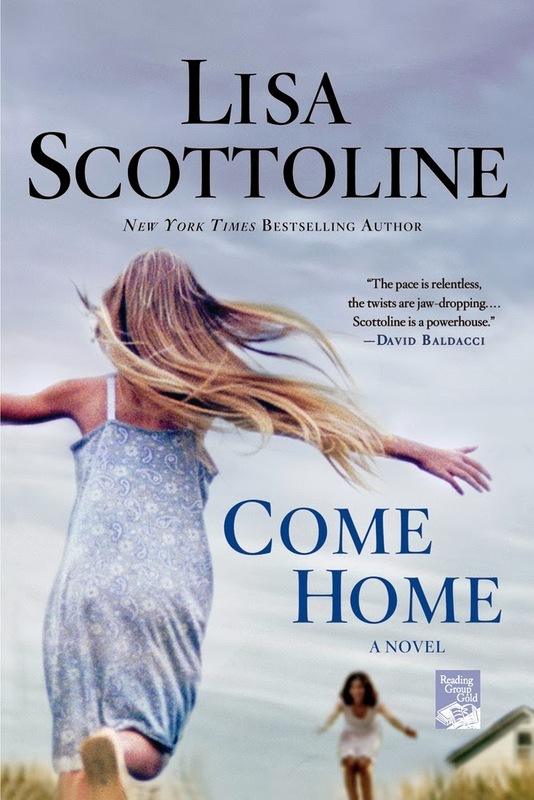 Jill's life is turned upside-down when her ex-stepdaughter, Abby, shows up on their doorstep late one night and delivers shocking news — Jill's ex-husband is dead. Abby insists that he was murdered and pleads with Jill to help find his killer. Jill reluctantly agrees to make a few inquiries, and discovers that things don't add up. As she digs deeper, her actions threaten to rip apart her new family, destroy their hard-earned happiness, and even endanger her own life. Yet, Jill can't turn her back on a child she loves and once called her own. This wasn’t the usual type of book I’d read, but it had me gripped from the very beginning. I’ve seen that it's had some negative reviews, but I personally found it to be well written, well-paced and I was literally on the edge of my seat on so many occasions just wondering what was going to happen next. It was the kind of book where you can’t help but constantly try and second guess what happened to Jill’s ex and who was involved in his death, leaving you desperate to find out if you’re right or not (I wasn’t…), but with this being paced just right to keep you guessing until you get to the final chapters. I wanted to scream at Jill not to get involved in some parts; she was a likable character and I wanted her to be happy with her new husband-to-be and daughter and not be drawn into Abby’s investigations, but it wouldn’t have made for much of a plot if she didn’t. Abby isn’t that likable (nor is Jill’s ex-husband) and you wonder if you can trust her, but you feel Jill being emotionally blackmailed into getting involved. When she does you have to stick with it and hope she comes out of it okay. I didn’t always find it believable that Jill would risk everything she had to fully immerse herself into solving this mystery herself. If I ignored those niggles, I did really enjoy being on a roller coaster ride with this plot, particularly when Abby goes missing and Jill’s involvement and need for resolution becomes even stronger. I’d recommend this book to anyone who enjoys stories which explore complex family relationships and mysteries. Thanks to Ebury Publishing for the book in exchange for an honest review. Didn't like this book at all. I LOVE her old attorney books, but not these new ones she has tried. Totally agree with Pat. This story fell flat for me (as have her last few novels), but I love her Rosata & Associates books. There's a new one out this month, and I can't wait to read it.